Through the almighty Divine Will itself, to each human being is associated from the moment of birth, a so called Guardian Angel. As the name shows it, the Guardian Angel is a sublime, bright angelic entity, of whose main responsibility, connected to the human being that s/he is protecting, through a divine mandate, is to protect, guide and inspire in a secret, godly manner. According to the spiritual level of the being, his\her guardian angel can belong to any of the 9 hierarchies of light, starting from the hierarchy of the Angels (in the case of the ordinary beings) to the hierarchy of the Seraphs (this in the case of the human beings who came to Earth [reincarnated] already having a level of consciousness and godliness that is extraordinarily elevated). There is one guardian Angel belonging to one or the other hierarchies and angelic legions (in accordance with the spiritual dimensions of the divine protection that they have the mission to ensure) also for each human community (ethnicity, nation, human race) and for each heavenly body (planet, star, galaxy, etc.). Usually, the guardian angels are spontaneously manifesting their support and divinely-protective influence when the human being truly needs them, because the mission they have from God, in respect with our being, is of acting like a sublime Providence (as a rule, apart from this responsibility, they are also in charge with numerous cosmic functions). Their joy is immense when the human being they are guarding, is firmly orientating towards God and does great progresses on the path towards perfection. Also, as the respective human being is advancing more and more on the path of sanctity, more and more angels from the superior hierarchies are associating (sent by God) to the guardian angel of that being. In this way, the advanced spiritual yogis are assisted, protected, inspired and sustained not only by their guardian angel, but by many other angels; in the end, when the being reaches the state of spiritual liberation, God’s all angels of light can help that being in any spiritual action, that he/she does or aims to do. This phenomenon of multiplication of the divine help, which the aspirant, full of passion towards the Divine Grace, receives it from God through His angels of light, is as possible as it can be, if we take into account that, to the extent of his spiritual elevation, the aspirant is submitted to tests and initiatic attempts that are more and more difficult. Sometimes the human beings who are extremely fallen, unfortunately can orientate irrevocably and consciously, on purpose towards evil, against God’s Will. In this tragic situation, those abject beings will go through (most of the time without knowing) a terrible experience of losing the guardian angel. Then, that unhappy being will enter under the incidence of a “personal” demon, appointed by Satan himself. On the other side, through his guardian angel, the human being who is pure and full of the aspiration of ecstatically uniting himself with the Divine Supreme, can easily enter into a sublime state of resonance with any of God’s angels of light. Each guardian angel is unique in his way and is different from any other guardian angel, just as we are different from the other human beings. And since our guardian angel is intimately connected to the profundity of our soul, the better we know ourselves and we get to awaken our soul (to be aware of the sublime energies of our soul), the more we will spontaneously grow closer and more “familiar” to our guardian angel. Usually is necessary a profound self-knowing in order to discern the unique characteristics (resonances) and sublime inspirations of our guardian angel. Even in the absence of this high spiritual level, we have at our disposal a very easy and efficient method, accessible to anyone, of opening our heart towards the guidance and divine protection of our guardian angel. All that is necessary for this is a great innocence and purity of the soul: it is about of the –apparently “ordinary”- prayer: “Angel, My Guardian Angel”. Because our guardian angel was chosen and offered to us by God Himself, the relationship between us and our guardian angel is meant to be one of the most intimate connections in our lives. Our guardian angel always knows everything about us, and his/her love for us is complete, unconditional and unchanging, because it is deeply rooted in the Absolute Love of God. Thus, our guardian angel in reality is the dearest and closest friend and protector, until the moment we meet our Spiritual Master, who will take over this divine mission of spiritual guidance, though the connection with our guardian angel will continue afterwards, being involved. Thus, even after meeting the Spiritual Guide, our guardian angel will also fully contribute to our spiritual growth under the guidance of our Master, as the guardian angel was the one who led our steps in silence towards meeting the Master. A strong connection with our guardian angel will help us a lot to defeat the different inferior temptations and deviations from our spiritual path. Indeed, the mission of our guardian angel, related to our being, is the one of accompanying, inspiring, rousing us spiritually- according to our level of inner superior receptivity- our entire life, just like a divine guide and protector. As we become more and more aware of the divinely inspiring presence of our guardian angel, a sublime pure and unconditional connection of love takes shape between us and him, and implicitly, according to how we participate to this divine love relationship, we gradually gain, through telepathic resonance, certain aspects, characteristics and spiritual gifts of our guardian angel, because our love towards him, putting us automatically, in a state of empathy with him. The human being who becomes aware of the secret connection with his/her guardian angel and opens up more and more towards the angel’s guidance and divine inspiration, should not be afraid of anything. Through his guardian angel, the human being can obtain much easier the telepathic contact with any of the 9 angelic hierarchies, or with God. On the other side, so great is God’s Love and Compassion for the Creation, that God not only offers a guardian angel to each soul, but he offers a guardian angel to each nation, planet, city, town, village etc. and the guardian angels of these places have a great importance for those specific areas. Thus, according to the human beings from those areas, who will start to open up more and more, in order to receive the protection, spiritual guidance and the sublime joy from the respective guardian angel, many of the bad things and sufferings they are facing will cease to exist, as well as the subtle-perverse and malefic influences of the infernal levels. In conclusion, the connection of the human being with his guardian angel is the easiest to develop, is the most intimate, and if the respective being has not met yet his Spiritual Master, is even more the most efficient connection, from a spiritual point of view, because it transforms life very quickly (both spiritual as well as material life) of that being, through the immense power of the guardian angel. Becoming aware of the connection with the guardian angel can be the first step, made by the human being, towards God. 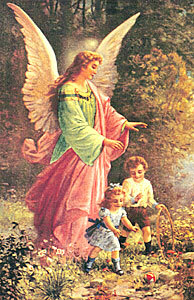 As part of the awareness about the presence of angels in general and of the guardian angel in particular, although the declared materialism, atheism, or even the Satanism are especially present in our age, nevertheless there are some extraordinary experiences which have allowed some ordinary people to become conscious of the sublime angelical entities. Most of these experiences are represented by the so called “clinical death” or coming back to life after the physical body apparently has shown all signs of death. ( N.D.E. or NEAR-DEATH-EXPERIENCE, the usual terminology in parapsychology). The famous researcher of these cases, dr. RAYMOND MOODY, says: << In certain cases, the subjects were saying that the entities they met in the so called “tunnels” (the sensation of entering in a sort of “tunnel” is one of the experiences met at all the subjects who had N.D.E.) were in reality their guardian angels. For example one of these entities of light (ANGEL) said to a dying person: “ I came to help you only in this situation, but you should know that from now on i will entrust you to another spirit”>>. Presently there are numerous statements of this sort, but maybe the most impressive testimonies of the providential help, which is offered by the guardian angel, who helps his/her guarded human being with avoiding some tragic or catastrophic situations. For example, this kind of situation apparently ordinary, is extracted from the rich parapsychologic casuistry: a woman who was driving her car in an area with sinuous road, close to Los Angeles, at a certain moment suddenly and very distinctly heard a voice, as it was coming from the inside of her head, and which was telling her: “Now you have to drive on the left side of the road!” . The woman listened to that voice and went onto the left side of the road. A few seconds later she noticed that a truck, which was going exactly in front of her, suddenly was braking, so he collided very badly with the car behind him. That was exactly the place where the woman with the car should have been, if she wouldn’t change the side she was driving on, after being warned by the mysterious voice. Often, our guardian angel interferes in a miraculous way (and we could say providentially) in order to guard us from serious accidents or from certain dangers which could cause us a violent death, although this would have been imminent. In this direction, is already famous the case of a church in the United States, where a terrible explosion happened, due to a damage of the gas heating system, paradoxically however, all those who where supposed to be in that church and many of them who where never late until then, although they were coming to that church for many years, they were ALL sufficiently late (each one of them had a very good reason to be late), arriving there only after the terrible explosion took place! This kind of cases are in reality quite frequent, each one of us knowing from our own experience, at least one or hearing from friends: “If I did not stop DON’T KNOW WHAT REASON in that moment, and I would have continued to go ahead just one more metre, I would have been hit by the truck”, etc. In other situations, the help of our guardian angel is so powerful, that the human being is saved as through a miracle from an imminent catastrophe, due to the fact that in that moment, miraculously time is effectively suspended for her. For example, it is known the case of a soldier who was transporting a howitzer, together with a fellow, in Beirut city. Suddenly they heard very clearly the noise of a bomb, that was coming exactly towards them. They have thrown themselves onto the ground and they only had time to cover their heads with their hands. Then, the respective soldier saw very clearly the shell-bomb coming above them, but very slowly, exactly like he was watching the scene in a movie in slow motion. Afterwards he confessed that in those moments he could very distinctively distinguish the specific shape and wings, as well as the curve trajectory that the bomb had, which ended only one metre from his head, in a sandbag. And although, he then knew that from the explosion in such a situation he would die, the respective shell miraculously did not explode, so the two of them got away only with a sturdy affright. In other situations, the human being gets to be projected into the future, thus becoming conscious of all the tragic successions of the accident, and then as through a divine miracle, that person succeeds to avoid the accident. In other situations, the help of our guardian angel manifested long before a tragic or dangerous situation, through a dream which was upsetting us a lot or through multiple phenomena of synchronicity. For example most frequent case is the warning dream, dream that cannot be forgotten, and which determines us to do a certain thing or to act in a certain way in order to take an almost immediate decision. And although, generally we don’t exactly know why, we take that decision. After that we ask ourselves why did we take such a decision, but only after a few weeks or maybe after a year we discover that we did a very good thing. This kind of inspired dream cannot be forgotten and can never be mistaken with the ordinary dreams. The same applies to the extraordinary phenomena of synchronicity or to the totally unexpected helpers whom we receive exactly when we need them, and in this direction, the casuistry is huge. Of course, in all these situations, the inner purity of a human being, who receives the help which is unselfish and full of love of the guardian angel, is an important factor, because this makes the being capable to feel through telepathy, entering into resonance with the sphere of manifestation of the guardian angel, the agent of providence. Thus, we can now understand why these divine invisible helpers are not manifesting for everyone in the same way, or other times, although they manifest as warnings, these are not taken into account by the dull and brutish human beings. For example we meet cases, where after a terrible aircraft accident, only one person remained alive, and moreover, that person was sane and unharmed. Or, in a line of cars which collided against each other, we can meet one, out of the 50 injured cars, which is untouched. Or, in the same chain of accidents, a woman, immediately after the shock of the collision, is inspired to go out of her car immediately and to get away from it; 5 sec later, a truck crashes her car completely, etc., etc. 1) These entities emit a love which immediately inspires an unconditional trust, as well as the safety of the subject who is astral projected. 2) Generally, at the beginning they present themselves with the face hidden in a sort of “shadow”, in order not to scare. And when the subject had familiarised himself with their presence, usually he does not perceive but a very bright light. 3) When these entities of light are talking, they limit themselves to the vocabulary known by the subject. It is extremely significant the fact that, although before his experiences of astral projection, MONROE was an atheist and materialist (he was an ordinary business man), these experiences have made him truly believe in the existence of GOD. Is also very significant, in this context, the statement of the famous doctor, physician and main researcher, JOHN LILLY, who publicly declared, with the risk of being ridiculed by the “orthodox” science people, that he owns a big part of his scientific inspirations, to the direct connection that he has with his guardian angel. About the angels, he also said: “It is about entities who are undoubtedly superior to us.” Indeed, each angel who has reached the stage of guardian angel is situated much more above the spiritual level of the being that he/she will protect or inspire. The guardian angel is with us from the moment of incarnation and until the moment of death, and in certain situations even in the world beyond – between two successive incarnations). Therefore, we can state, in finalising this presentation about the essential aspects of the guardian angel, that is very important for any human being, who intensely aspires towards the spiritual perfection, to enter into as deep as possible connection with his/her guardian angel, this being able to help immensely in his /her effort of godliness. Not one prayer is refused, if it’s addressed to our guardian angel, with the condition that this request is to get us even much closer to God. Moreover, if we wish to communicate much better and more profoundly with someone (loved being), we can, for example, ask the help of our guardian angel to communicate and to fuse with the other person’s guardian angel.